At Sanders.Law in Kansas City, Missouri, we not only want to help you recover the damages you incurred as the result of someone else's negligence or wrongdoing, we want to hold the responsible parties accountable for their actions so the same incident doesn't happen again. This is what we mean by justice, and the attorneys at our law firm will fight for you every step of the way to help bring closure to the situation and provide you with peace of mind. Serving clients throughout the Kansas City metro region and the surrounding areas of Kansas and Missouri, our attorneys deliver the personalized attention and compassionate support you deserve. Committed to helping keep our communities safe, we aggressively pursue catastrophic personal injury and wrongful death claims resulting from accidents and mishaps caused by people's negligent, careless and unlawful actions, particularly car accidents caused by drunk drivers. However, we handle all other types of personal injury cases as well, including construction accidents, gun accidents, nursing home negligence, defective products, tractor-trailer wrecks, accidents involving injuries to children and more. Backed by decades of combined legal experience and utilizing a vast network of professional resources, our attorneys work as a team to build the strongest cases possible for those we serve. Working closely with you, we will seek to fully understand your situation so that we can devise the most effective strategy to help you secure the maximum amount possible for your losses as well as for your pain and suffering. Having recovered millions on behalf of our clients over the years, our law firm has earned a reputation as one of the top personal injury practices in the region, and our attorneys have won numerous awards and honors for their professionalism and service. 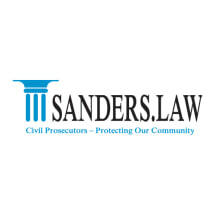 To find out more about how Sanders.Law can best serve you during your time of need, you can contact our law office to schedule a free initial consultation.